Nothing beats a good book, or a great meal, or an irresistable treat… so it’s even better when these are combined! Here is a selection of some novels with a food-theme. This is part two, so if you missed part one, you can see it here. When Maddy loses her high-paying city job, her instant reaction is blind panic. But after the ‘drowning her sorrows’ hangover has cleared, she realises that this is an opportunity to change her life and do what she loves best: baking cakes. And so she sets up her own cake company, embracing the highs and lows of getting a new business off the ground, while looking for love along the way. 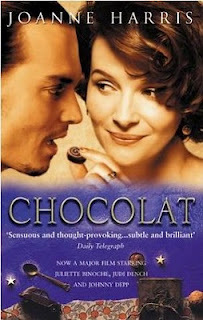 Chocolat was also made into a movie with Johnny Depp and Juliette Binoche. You might win: a cash prize You might lose: your heart. Eve had her world torn apart three years ago, when the love of her life Ethan disappeared, and she never found out why. But now, her life is rosy. With a lovely new boyfriend, Joe, and a café opening on the cards, things finally seem to be falling into place. 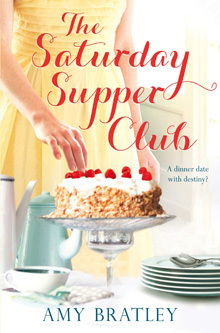 … until she agrees to take part in a supper club competition for a local newspaper. Eve is cooking the first dinner and who should turn up on her doorstep expecting a three-course meal, but her long lost love Ethan? By turns rapturous and rueful, this wise and funny author (whom Booklist calls “Anne Lamott’s hip, yoga- practicing, footloose younger sister”) is poised to garner yet more adoring fans. This was also made into a movie with Julia Roberts. 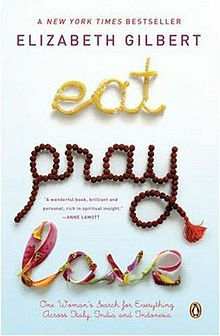 Posted on May 25, 2012, in Book Covers, Mouthwatering May and tagged books, chick lit, chocolat, eat pray love, Mouthwatering May, reading, romance, women's fiction. Bookmark the permalink. Leave a comment.